For many years, the Winchester World Series of Competition Calling attracted the best callers in America to southern Illinois. Sunday afternoon featured the marquee event of the festival, the Winchester World Open Goose Calling Championship. In 1997, along with four other honored gentlemen, I was selected to judge "The Winchester." Thirty-five of the nation's most decorated Canada goose callers assembled to blow their routines in pursuit of prizes, purses, trophies and title. After four rounds and hours of calling, the finals field was narrowed to five callers. Callbacks to break two ties were heard before we judges were invited to meet the mystery winners at the awards ceremony. A total of six points separated the exhausted finalists. In my mind, they were all champs, worthy to wear the Winchester first place coat. When the name, Jeff Foiles, from Calhoun County, Illinois, was announced, I was shocked. It was the same guy who had grown up hunting with his father, Burdette, and granddad, Merlin, next to our duck club near Duck Haven in the Pike County Sny Bottoms. Even though Jeff had worked as a professional waterfowl guide and tinkered with duck and goose calls all his life, "The Winchester" finalist accomplishment jump-started his rise to the top in competition calling and, ultimately, the call manufacturing industry. Foiles Migrators "Strait Meat" calls hit the market in 1999 and the waterfowl community embraced them. As the twenty-first century arrived, so had duck and goose calling titles and championships for the captain or members of his Migratory team. A first place finish in the 2000 World Goose Calling Championship set the pace, and since, then most major contests in America and Canada finds one or more "Strait Meat" guys on the winners' podium. Members of the pro staff are found in 42 states and several provinces north of the border. At the late summer Ducks Unlimited Great Outdoor Festival in Oshkosh, Wisconsin, Wildfowl editor, Jay Strangis, accepted an invitation for a fall duck hunt at the D & J Strait Meat Club. His schedule was open for the three days after Thanksgiving and Jay's crystal ball couldn't have predicted a better time. Traditionally, Mr. And Mrs. Mallard and friends choose this week to make their grand entrance into the water-covered cornfields near Pleasant Hill. Arrangements were finalized in early November and the hunt was set. It took yours truly less than a moment to accept a like invite from Jeff. My first assignment was to find the Wildfowl editor amid the many Thanksgiving weekend travelers at a very busy St. Louis Lambert Airport. The Northwest flight was right on time and Jay's camo-clad camera bag quickly identified him. Next order of business, grab the bags and travel the 60-odd miles to the waterfowl club. The journey would take Jay and me north on Missouri's Route 79, following the Mississippi River. Passing through St. Charles and Pike Counties, I pointed out historic "duck clubs" such as Busch's Beleau Farms and Cuivre River Club among the many. We visited and talked waterfowl until a close encounter with the Foley speed trap where the local constable got our attention, following my suburban several miles before turning back. Jay must have looked suspicious as he munched on the turkey sandwich my wife, Jan, had prepared for lunch. Crossing the "Father of Waters" over the Louisiana bridge, we entered Illinois where Club D & J is located in the vast Sny bottoms farm country. Arriving amid an entourage of camo-covered warriors enjoying a late lunch, Jeff made the introductions. Some seemed impressed, others just responded, "Okay boys, have a good hunt." The stringers of lifeless mallards hanging from the clubhouse porch railings were evidence that the hunters, not the ducks, had indeed enjoyed the morning. Path to the "Big Pit" at Club D. & J.
Jay and I dressed without pause while Jeff loaded the four-wheeler for our ride to the levied forty-six acre pumped cornfield. Hawk, Jeff's yellow lab, seemed anxious to get back to business even though he'd retrieved many of the almost scores of ducks bagged the previous three days. Hawk led the way through the thigh-deep water to the 'north pit" which faced the tall oaks outlining the nearby Delair sanctuary grounds of the Great Rivers National Wildlife Refuge. When we reached our destination, the scene before us was more than impressive. A huge pit which resembled a large mound of cut corn stalks and an open pothole decorated with strategically placed decoys greeted us. "Climb in and make yourselves comfortable," called Jeff as he waded the water to activate four battery-powered motion decoys. Observing the iron tank, large enough to accommodate six hunters, it was obvious that the architect was a pro. Camouflaged to the max, with the shooting area at eye-level to the water, Jeff explained that his early years as an ironworker building skyscrapers and bridges was far more challenging than constructing our hunting hide. Before we could uncase the guns and grab our ammo, the cries from Jeff's "Timber Rattler" meant something was up. And, indeed, that was just the beginning. For the next two hours a steady parade of singles, pairs and small bunches of mallards danced to tunes of duck music. To make us feel worthy of the occasion, Jay and I were allowed to join Jeff's band. Jeff's orders of "Kill that duck!" were quickly followed by the blast from one of our guns. Sometimes the results were impressive, others, a little embarrassing. Good-natured ribbings were quickly forthcoming following a miss. At 4:15 that Friday afternoon, three happy hunters and a dog named Hawk headed for the clubhouse with a limit of 12 mallards. Imagine, if you will, a guy leaves the Twin-Cities at 11 a.m., checks out of the St. Louis airport after 1 p.m. and wades from a flooded cornfield before 4:30 of the same day with his four-bag limit of ducks. That guy was Jay Strangis and I'm his witness. Only in America, thanks to Jeff Foiles. Our instructions after the evening dinner at Pittsfield's Red Dome Restaurant were to bunk the night at the house on E. Quincy in Pleasant Hill and to be back at the club at 5:30 a.m. sharp. When asked, Jay told Jeff that our accommodations were great except for the hourly takeoff of the jet powered refrigerator motor. n light to the surrounds of "north pit." A third member had been added to the party, Brian Rennecker, a fulltime employee of Migrator. Brian is a professional cameraman and this day's assignment would be to film the hunt as part of Jeff's latest DVD series, Fallin' Skies V.
I had doubts of a repeat of Friday's success due to the heavy overcast and dead calm but my fear was soon erased as a pair of mallard drakes accepted Jeff's invitation. Shooting had begun at 7 a.m., not only for us, but also hunters in the "big pit" of the forty-six acres. Shots from the club's third pit located in a similar setting about a quarter-mile east indicated that the party had begun. Although the birds seemed more reluctant to decoy, Jeff's repeated command of "Kill 'em!" echoed throughout the early morning. By 9:30 a.m., a peek of sunshine shown through and the ballgame was over, as Hawk fetched the last of our 12-mallard limit. What do we do for an encore? FA Brand decoys cover both blinds and water holes in flooded corn. D & J clubhouse manager, Tim McGowen, had bacon, sausage and eggs almost ready as we hung up the ducks and waders. Jeff's comment was, "Man, aren't cell phones great!" After breakfast, Jeff suggested an ATV tour of the entire hunting operation. An hour later, Jay and I headed to Foiles Migrator Headquarters, some 20 miles away, at the Pittsfield location. The complex including an attractive retail store, call assembly operation, business offices and warehouse, all under the same roof, was completed in the summer of 2004. Jeff's lovely daughter, Lisa, manages the facility. Stocked with quality hunting merchandise, hunting apparel and lots of Jeff's calls, the store is decorated with decoys, ducks and Pike County whitetail trophies. World champion duck and goose caller, Shawn Hammock, and pro Drew Ward assemble and tune each call prior to sale. My friend, Mr. Strangis, tested every "Final Approach" layout blind on display as yours truly took instruction from Jeff on the "Strait Meat" way to call geese. The afternoon and evening flew by as a blue-wing teal: sightseeing, duck talk, dinner at the Lighthouse Restaurant, return drive to Pleasant Hill and a great night's sleep despite the refrigerator. Sunday morning found Jay and me thanking God for another day on our short trip back to the Sny bottoms. Jeff informed us, "Today we'll hunt the 'big pit.' No need to rush." Jeff's good friend, Merle McGlasson, and professional cameraman, Jeff Evans, joined us as did "camera guy" Brian as Hawk again led the way. The "big pit" almost defies description but I'll try. Buried in the flooded cornfield, an earthen walkway leads hunters to the entrance to the hide. The structure is thirty feet in length, seven feet from floor to ceiling, with electric lights, a gas range for cooking and heat. The shooting platform brings the hunter eye-level to the decoys. Wow! Jay and I marveled at the labor it must have taken to construct and conceal the big pit. The morning's light rain made no difference to the mallards. As if by design, the shooting was steady and the cameras were rolling; Jeff Evans inside the pit, Brian Renneker from the nearby camera blind: more video footage. Ten o'clock found Jeff, Merle and me heading to the grass-covered levy with our mallard limit as two of the younger generation of waterfowlers joined Jay, two drakes shy, in the "big pit." Cole, Jeff's fourteen-year-old son was accompanied by his friend, Devin Schuman. 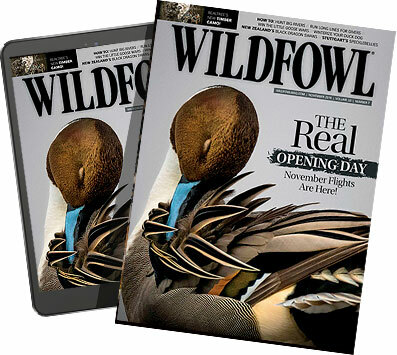 The boys wanted to display their skill and add the Wildfowl editor to their "guided list." After lunch, the suburban was loaded for the return to the Alton River Bend where Jay would be introduced to my wife, Jan, and the Reid duck call collection. Bidding our new friends farewell, clubhouse manager Tim, in charge of cleaning and scoring the kill, informed us that hunters had bagged 191 ducks from the various blinds in our three days at D & J Strait Meat Club. Unbelievable! A happy post-thanksgiving crew: (l. to r.) Jeff Foiles, Cole Foiles, Larry Reid and Jay Strangis. Evening fell as our trail followed the Mississippi, then crossed over Calhoun Ridge to the Illinois River where she completes her journey at historic Grafton, Illinois. The Great River Road took Jay and me to our final destination. Assessing our three days was simple: Great! Our host and guide, Jeff Foiles, is a successful and accomplished businessman, a tenacious hunter and our friend. Returning Jay to the St. Louis airport, the "Take it easy," and "Good hunting" remarks being exchanged, my final words to my huntin' buddy: "Waterfowl fly--therefore, we are." Larry Reid is host of "Outdoors with Larry Reid" which airs Sundays at noon on WBGZ Radio, 1570 AM. Illinois is a waterfowling state, make no mistake, and the muddy bottoms of it's Mississippi and Illinois River flood plains, those rich lands that grow super corn, super soybeans and super deer, also attract super numbers of ducks during the Central Flyway's late fall push. The bottoms also grow "river rats", those boys and men, and old men who dress in dull garb, speak with accents almost southern and take pride in welded flat-bottomed boats that'll bounce off of river bars and tuck into backwater bays. Men who speak the language of ducks seem to be everywhere in the towns inside the big levees, where gas stations fill thermoses at dark-thirty and morning blackness reveals taillights and trailers scattering hither and dither to timber hidey holes and flooded fields. Truth be told, I've hunted ducks in the bottoms of the Mississippi river, both in it's northern reaches, where wild rice grows and in the deep south where flooded milo, rice and timber reign. But until this past fall, I'd never seen a cornfield flooded with a pump. Where I come from, on the edge of the northern prairies, flooded corn means sheetwater in a harvested field; an act of God that occurs in the fall one year out of five and sets up the potential for some super duck hunting. Otherwise, our good corn hunting is on dry fields that have been picked or sometimes picked and chiseled. , flooded corn is king, a phenomenon that has resulted in thousands upon thousands of flooded acres, even on state managed refuges and hunting areas. The result is a competition for birds that has left traditional duck holes empty, accounted for greater numbers of resting mallards and other ducks, and made flooded corn itself good or bad in terms of hunting results of various clubs., the competition being so great. But the ducks have plenty to eat at night! Most waterfowlers know Jeff Foiles from his company, Foiles Migrators, his Strait Meat Calls and his propensity to splatter ducks and geese to the tune of rock music on his videos. Few except the river rats of Southern Illinois know where Jeff came from; his humble beginnings, and understand how far he's come. Jeff hand tunes a new call for a young customer at his retail store. Jeff grew up in a small and modest country home in the hills of western Illinois, not far from these rivers. Jeff followed in the footsteps of his dad and many of his peers, becoming an iron worker, welding together the heavy spans of the big bridges that reach across so many places on the river and backwaters in his neck of the woods. Jeff also followed his dad to the bottoms to hunt ducks. From his early exposure to duck hunting came a passion for waterfowling. And Jeff is one who followed his passion until it became a career. From World Calling Championships, to making and selling his own calls, to labeling his own hunting products to building his own retail business and to eventually building his own duck club from a barren piece of bottom ground. Jeff didn't do any of it the easy way and along the way he had a lot of help from his friends, the same good buddies he holds in high regard today. When you're outside looking in, the world seems to be at Jeff Foiles' feet. But Jeff is flesh and blood, like the rest of us, with the same pains, same joys, same crazy desire to be under working birds. Yes, he's living the dream: A river rat's dream!